Stuart Swales has admitted deliberately driving his van into the window of Java Cafe in Whitby. A builder has admitted deliberately driving his van into a coffee shop in Whitby – just minutes after damaging a window at one of the town’s top fish-and-chip restaurants. Stuart Desmond Swales, 32, was drunk at the time of the bizarre incidents in the early hours of September 1. York Crown Court heard that the self-employed building contractor’s Renault Kangoo van ended up “half in and half out” of the Java Café in Flowergate after smashing through the shop window. The shocking incident occurred just five minutes after Swales damaged a window at the Angel Fisheries restaurant on Baxtergate. No injuries were reported in either incident. Swales appeared in court on Monday intending to deny the dangerous-driving charge but admit criminal damage. However, judge Andrew Stubbs QC questioned the logic of Swales’s denial in the face of overwhelming evidence. The judge advised Mr Parkin to confer with Swales and consider his plea given the mountain of evidence stacked against him. The case was stood down briefly, after which Swales entered a guilty plea to dangerous driving as well as one count of criminal damage and the drink-driving charge. 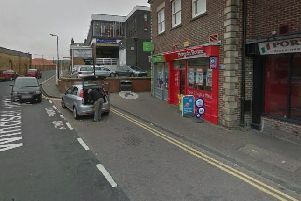 Swales, of Abbots Road, Whitby, admitted dangerous driving in Flowergate at about 6.10am. He also admitted damaging windows at Angel Fisheries at about 6.05am. Mr Stubbs QC adjourned sentence for probation reports. Swales was granted bail until the sentence hearing on January 7 next year. He was given an interim driving ban until then.